As we have started making a habit of eating out on a Sunday, we shall from now on be reporting back on our findings. On Sunday 30th September we visited the charming village of Fillongley, which stands on the Bourne Brook. It is full of little cottages and has a couple of shops. After a walk through the churchyard and then into the fields to see the humps in the ground that are all that is visible of the castle, we retired to the Manor for lunch. I was pleased to find that it hasn't changed that markedly since I was a youngster. It still has seperate bars and the feel of a country house, with a roaring open fire too! There is a good sized garden, although not as large as I remember as I am sure it used to lead down to the banks of the brook. I think this has been fenced off, no doubt due to health and safety considerations. In one place the brook still runs past the pub car park. CHOICE 5 Just beef or turkey, no veggie option. Was there a sweet course or not? ATMOSPHERE 8 A great country pub. Nice and quiet. No doubt the licensees would like it a little more busy. DRINKS CHOICE 8 Good enough choice, but no local brews. There was also a wide choice of papers at the bar, so all in all I heartily recommend Sunday lunch at the Manor. Most civilised and I hope that the business proves a great success for the new incumbents. Whilst out there we also popped into the Cottage Inn. Don't bother, as if you haven't booked you won't get in. Besides, this is now a restaurant, not a pub serving food. The atmosphere is absolutely zero. The Phantom Coach on Charter Avenue is a sizzling 'pub', which, as you may already know, means that the choice of beer is hardly sizzling. Banks Bitter and Bombardier, which at least was in good condition, unlike a neaby 'sizzling' pub (The Clarence) which no doubt will be reviewed at a later date. The pub was built at much the same time as the Coventry bypass, in the 1930's and the inside still has a 1930's feel, so much so that it is looking a little tired now: particularly the entrance to the kitchen areas and the toilet doors. The cutlery was also tired; that is scratched and dirty. Furthermore our salt cellar was empty. VEG SELECTION 5 Chips and peas or frozen roast potatoes. DRINKS CHOICE 4 Bombardier or Banks - I ask you! At least the Bombardier was in good condition. Its a rather tired looking pub run by a boring chain. The Old Clarence is the better of the two, but why not treat yourself and drive out to Fillongley for a change. On this occassion we tried the Denbigh Arms in Monks Kirby for Sunday lunch, as it is reccommended in the 2013 Good Beer Guide. The pub is so named because the Earl of Denbigh owned most of the village and still lives in his ancestral estate, Nenham Paddox, neighbouring the village. We've had good reason to visit this lovely pub twice this year - as part of our ramble No.201 Wood Farm Brewery, and back in the summer Bank Holiday when they staged a weekend beer festival that nobody knew about! It's also convenient as the No.585 Coventry to Rugby bus stops 14 minutes walk from here on Sundays (every 2 hours), and right outside the pub on weekdays and Saturdays (every half hour). We were suitably impressed. Including the vegetarian option there was a choice of five meals for Sunday lunch. In fact, all four of us went for 'roast loin of pork with pigs in blankets, sage and onion stuffing and apple sauce' as described in the menu. All four meals came without any apple sauce, so we asked for some and were given a tiny pot between the four of us. The 'pigs in blankets' were in fact one pig in one blanket, singular. The local beef also looked good - being a thick, chunky, cut. The ales on offer were Doombar, Landlord, Abbot and Thwaites Wainwright, at £3.20 a pint, so a good choice there. A lime and soda cost £1.00. For afters Jane and I shared a cheeseboard, which was beautifully presented and it is good to see the cheeseboard on a menu these days. SERVICE 8 Quick and attentive, just right, except for the difficulty of getting our apple sauce as was advertised in the menu. CHOICE 10 Five choices for Sunday lunch plus a good selection of vegetables. VEG SELECTION 9 A good variety and freshly cooked. DRINKS CHOICE 9 Good choice of quality real ales, however £1.00 for soft drinks. Giving a total of 53 out of 60, high scoring indeed and definitely our favourite so far. Lastly, why are meals presented as a tower of food piled in the middle of the plate these days? You then have to go hunting for your roast potatoes and 'pig in a blacket' at the bottom of the pile. And why is a sausage rolled in bacon a 'pig in a blanket'.....all mere affectation! This time we visited the Farmhouse, Beechwood Avenue in Earlsdon. This has been an Indian / English venue for some years now, and has recently been redecorated. I know that some people are not keen on the change from light pine decor to dark browns, but in my opinion dark brown is the proper colour for a pub, so I am very pleased with the change. The customers seem quite happy with the decor as it is advisable to book tables in advance, it has been really busy on the last two times we have visited. There is a large smoking 'hut' in the garden. Two of the girls ordered Sunday Roasts. Although within five minutes of sitting down we had been told twice about the days 'special', and were told that the roasts were chicken and beef, we weren't offered the vegetarian roast until Sharon had changed her mind over which one to order and then asked about a vegetarian option. Di ordered steak. I had to go for the Indian fish and chips, I couldn't resist. When it came the fish was in a bright red batter, superbly spicy and hot. It came with dahl instead of mushy peas, and chips. I sometimes avoid white fish as it is bland and like eating cardboard, but this was so good I never want to eat anything else at the Farmhouse. Jane observed that she would rather her gravy had come in a gravy boat than all over her dinner; Di found her onion rings too dry. For sweets, Sharon and I shared a cheeseboard. This consisted of three cheeses, a lovely creamy Stilton, a Cheddar and a soft cheese, accompanied with mango chutney and biscuits. Again, I love the fusion of mango chutney and cheese, buit was not so beautifully presented as at the Denbigh. Jane went for Gulab Jamun, sponge balls with ice cream, which she declared to be very good and well presented. SERVICE 8 Good and attentive and they do employ lots of staff. However they didn't offer a vegetarian roast until we had asked. DRINKS CHOICE 6 Only Abbot and IPA, £3.20/pint for the Abbot. Variable quality. This gives a score of 49 out of 60, not quite as good as the Denbigh Arms in Monks Kirby, but Sharon declared it was her favourite so far. I was also most impressed, but of course the beers were far better at the Denbigh and it is a much more attractive pub. What a surprise! Hidden away in Leaf Lane, beside the A46 fly-over is a little proper local pub, with traditional bar and lounge lay-out. It's like stepping back to my youth. The lounge was busy with eaters, so we formed a group of ten in the bar. We had to be there anyway as we had a dog with us. The choice on a Sunday is just beef or pork, or both. The vegetarian option is the same meal without the meat; there is no nut roast; so Sharon went for beef after all. The pork came with good, proper, crackling, whilst those of us who chose beef had a wonderful tender portion. The hosts explained that it is slow roast for hours to attain that level of tenderness. The vegetables were firm and 'al dente' just as I like them. I dare say my mother would maintain they were undercooked, but as I said, they were just to my liking. Unfortunately the roast potatoes were dry and floury, I suspect they were frozen ones. the cheese board consisted of cheddar and a good stilton with biscuits plonked on a plate. It was not as impressively presented as in previous weeks. SERVICE 8 Quick and attentive, just right. CHOICE 5 Only two options. No vegetarian dish. ATMOSPHERE 8 A proper pub. Dog friendly bar. VEG SELECTION 8 Excellent and freshly cooked. On this occassion we visited this lovely canalside pub. There were six of us, Fred, Shaz, Jane, Di, Graham the Canadian and Ed. We had an excellent choice of drinks with Hook Norton Bitter, Wye Valley Butty Bach, Abbbot and a Church End beers on offer plus Westons Cider and Perry. The choice for Sunday dinner was pork or beef or chicken. The pork and beef came in two sizes, the chicken was just half a chicken, take it or leave it. There was no horseradish or apple sauce: it was not offered. Other sauces were in sachets on the table. The roasts were real fresh potatoes, not frozen and the meat came in generous portions. Unfortunately the beef was also dry. There was an excellent selection of vegetables, but again, they were wet. There was no crackling with the pork. CHOICE 7 Three options. No vegetarian dish. VEG SELECTION 7 Peas, cauliflower, broccoli, carrot and cabbage freshly cooked al dente but rather wet. Real roast potatoes. DRINKS CHOICE 9 Greene King Abbot, Hook Norton Bittter, Butty Bach, Church End, Westons cider and perry. Giving 46 out of 60. A proper pub with food, not a restaurant with beer. Again, I would happily return. This time we stopped avoiding it and tried our local Wetherspoon, the City Arms. We walked in, ordered our meals and gave our table number. Then we decided that the table was too cold, being under the air conditioning vent, and moved. We told the bar staff where we had moved to. So when our meals came the staff hovered around our original table looking for us. We had to shout over to them to attract their attention. The change in table obviously hadn't been passed on. The first two meals, beef and pork, arrived together. The third meal, the vegetarian option, came 10 minutes later. There was no gravy boat, just a limited choice of sauces, all in sachets. These did not include apple sauce. The yorkshire puddings were made from some variation on concrete. All the meals were lukewarm, so any Greeks would have been most pleased with them. The vegetarian dish was very interesting, being made from lentils, carrot, pumpkin seed, mushroom, mozarella and a generous proportion of charcoal! SERVICE 3 Come on, this is Wetherspoons! The change of table was too much for them to cope with! CHOICE 8 An excellent choice; beef, pork, chicken, vegetarian plus the rest of the menu. ATMOSPHERE 6 The City Arms with the compulsory screaming child. VEG SELECTION 2 Frozen brussels; with peas and carrots. The carrots were tasty. PRICE/VALUE 4 £6.75 including a drink. Unfortunately this did not include any drink I would want as the guest ales are not part of the deal. DRINKS CHOICE 9 Brilliant choice. Giving 32 out of 60. Probably the lowest score we have given so far, but then it is definitely not a fine dining experience. It will fill you up, that I can say, and you will still find me drinking there two or three times a week, I just won't be eating there again in a hurry. 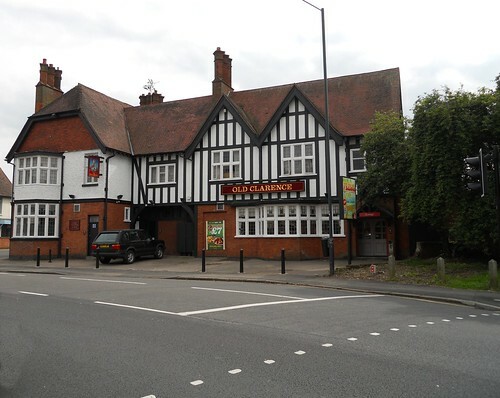 This time we visited another Earlsdon pub, the Old Clarence on Earlsdon Avenue North. We paid £ 6.99 for a regular Sunday roast, which included a drink; and £ 8.50 for Sunday roast inside a giant Yorkshire pudding. Jane had a bacon and cheese burger for £ 6.29 including a drink. The Yorkshire pudding was quite edible, not made of concrete as at the City Arms, although it was still not home made. Also, Sharon's vegetable roast was not charred as it was last week! The full menu is available on Sundays, not just Sunday roast. The food arrived hot. The sauces were delivered to the table in a wooden container - vinegar, tomato, H.P. and mayonnaise. We were not offered anything else, you just have to work out that there are other sauces at the bar. My meal came swamped in gravy, which I appreciated, but it would be nice to have the opportunity to choose how much you put on your meal! SERVICE 7 Quick, but no conversatioin at all when we ordered, about our options, or what sauces were available, or anything. CHOICE 9 Full menu. Two puddings for the price of one. ATMOSPHERE 5 Warm and comfy with no screaming children. VEG SELECTION 9 Peas, carrots, cabbage, mash, roast. The carrots were excellent. DRINKS CHOICE 5 No real ale. Wine/tea/coffee/soft drink included with the roast. Giving 45 out of 60. A really good score and I would be very happy to return, it certainly beats the pants off Wetherspoons as a dining experience and for atmosphere, but there isn't anything there I would want to drink. What did impress us was the sharing platter of sweets. Creme brulee, Eton mess cheesecake and ice cream cookie cup. The Eton mess cheesecake was in fact cheesecake with cream on top; we couldn't find much mess there at all. Jane said that she thought she could detect meringue, but the rest of us couldn't. We certainly enjoyed the sweet course. Towards the end of the sweet we were asked if we wanted any more drinks. I asked for a second pint of Mad Goose. The waiter returned to tell me that the cask of Mad Goose was finished and it would be another 10 minutes before the next one was ready. I replied that I wouldn't bother. So blow me, when the bill came they had only charged for two pints of Mad Goose! Naturally I soon got that changed, but it really is not good enough to charge for something that they couldn't supply! SERVICE 7 Very good. Quick and attentive. The Maitre shows you to your table. ATMOSPHERE 9 Wonderful. What could be better than eating in a cosy, half timbered ancient inn. VEG SELECTION 7 A reasonable choice well cooked. Giving 44 out of 60. A really good score and I would be very happy to return, it certainly beats the pants off other places as a dining experience and for atmosphere. I just wish that in such beautifull surroundings there was a better choice of ales. No doubt we have the Pubcos to blame for this.